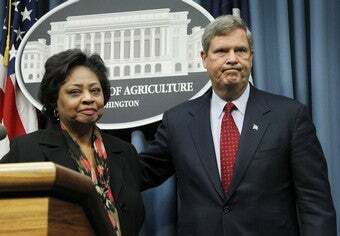 Fired USDA official Shirley Sherrod has turned down Agriculture Secretary Tom Vilsack's offer of another job. However, she doesn't rule out helping the department in the future. After firing her because of Andrew Breitbart's misleadingly cut video of her NAACP speech, Vilsack offered her a do-over: she could take her old job back, or become the USDA's deputy director of the Office of Advocacy and Outreach. According to the AP, the latter job was "designed to bolster the department's shaky record on civil rights." However, at a news conference today, Sherrod said no to both, explaining that she couldn't accept "at this point, with all that has happened." She said she might be open to taking a consulting job with the department in the future, adding, "I think I can be helpful to [Vilsack] and the department if I just take a little break and look at how I can be more helpful in the future." It's not a big surprise that Sherrod wouldn't want to immediately return to the department that basically booted her after watching a few minutes of edited videotape. Everyone has apologized to her, including President Obama, but no apology will change the fact that Sherrod was the victim of irresponsible right-wing fearmongering — and at least for a little while, this fearmongering worked. Vilsack says, "Maybe, just maybe, this is an opportunity for the country to have the kind of conversation Shirley thinks we ought to have." And indeed, maybe it's an opportunity for us to realize that black government officials in this country are still uniquely vulnerable to attacks and smears — and that apologizing for said attacks is no substitute for tackling the racism at their source.